Style. Comfort. Quality. Value. 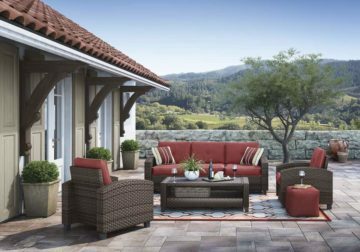 The Meadowtown 4-piece outdoor furniture set really goes to town, giving you the total package for outstanding outdoor living. Crafted to withstand the elements, this outdoor furniture set’s rust-proof aluminum frames offer the look of gently weathered wicker for an easy-breezy aesthetic. High-design touches include curved track arms and rich red cushions punctuated with white piping for a crisp, fresh feel. Perhaps best of all: the all-weather Nuvella™ fabric is as comfortable as it is durable. For indoor or outdoor use. Cushioned resin wicker seating. 2 throw pillows included with sofa. 4 piece set packed in one carton. Assembly required. Rust free aluminum frame. Wood look resin cocktail table top. High performance Nuvella fabric. 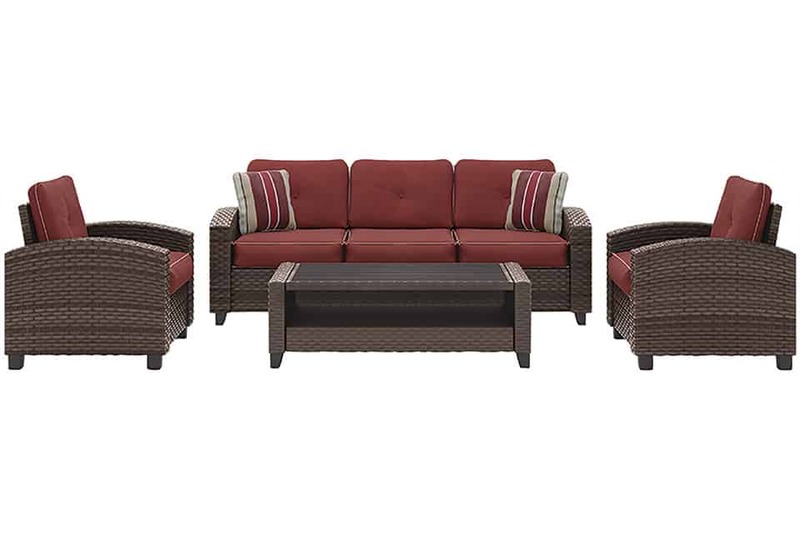 Sofa 76”W x 30”D x 30”H. Cocktail table 44”W x 25”D x 17”H. Lounge chair 32″ W x 30”D x 30”H.